The impeccable 325-member outfit from Florida’s Bethune-Cookman University is the band to beat. This year marks its 13th appearance in the showcase—the most of any band in the program’s history. 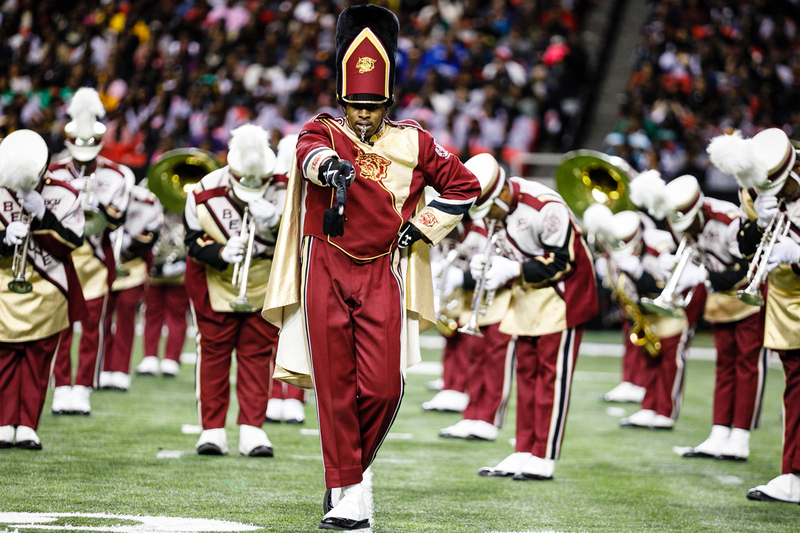 On January 27, the Honda Battle of the Bands will shine a spotlight on the high-stepping theatrics and thundering musicianship of historically black college and university marching bands. Now in its 16th year—and the first at Mercedes-Benz Stadium—we look at the famously spectacular showcase. The last time any Atlanta HBCU made the invitational showcase of the Honda Battle of the Bands. That year, the Morehouse College House of Funk made its second appearance at the event. Year the Alabama A&M University band was formed. Although several of this year’s eight finalists have long histories, the most storied belongs to the Marching Maroon and White—­it’s performed in a Rose Bowl parade, a governor’s inauguration, and a national championship. 8 bands will take the field for the finals. Each year, Honda invites all HBCU marching bands to participate, and fans vote online for their favorite schools. 2 finalists are making their first appearances in the Honda Battle of the Bands: Hampton University’s Marching Force and Miles College’s Purple Marching Machine. 20,000 dollars granted by Honda to each of the finalist bands to support their music programs. 120K people have watched the battle either live at the stadium or via livestream during the past two years. The theme of this year’s competition aims to honor the distinctive culture and rich traditions at HBCUs. Meanwhile, Tomisha Brock, the newly installed band director for Clark Atlanta University—and the school’s first female bandleader—vows that the band made famous by the movie Drumline will return. It has performed in the showcase seven times but hasn’t reached the finals since 2013.